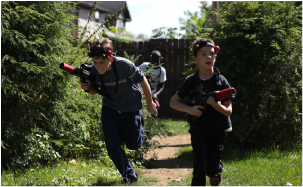 Our Laser Tag Parties are so fun, your kids will want to come back every year to battle their friends in our epic outdoor arena. We even take care of everything so mom doesn’t have to. Just bring the cake and let us take care of the rest! This party is fun for all ages! Play a competitive (or relaxed) round of mini golf, and finish the day with an exciting race through our giant adventure maze, or challenge your friends to climb the towering rock wall. Blast your way through a hot day! Our most popular option! 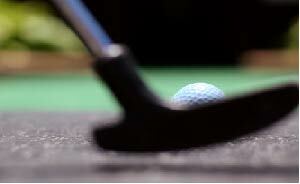 Warm up the fun with a round of miniature golf, and end on a cool note in our giant splash maze. With water around every corner, you'll get to blast your friends in an adrenaline-pumping watergun battle! 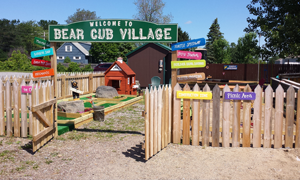 Children ages 3-7 will enjoy exploring the interactive play world of Bear Cub Village, then head over to enjoy a round of mini golf or run through the maze. Every kid will leave this party with more than just fun memories! 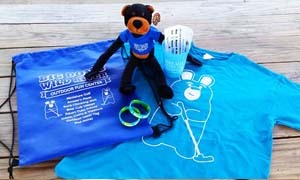 Each kid will pan and dig for their very own bag of treasure, then wash off in the squirt tube frenzy or play a round of mini golf. Have a date in mind? We now have online booking! 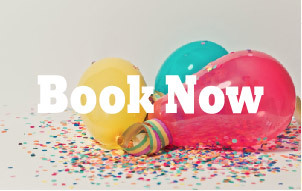 Still not quite ready to book your party and still have questions? 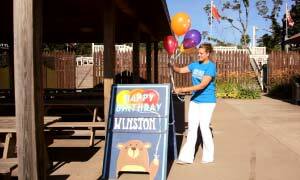 Our friendly staff will be happy to help you plan the perfect party. Give us a call at (315) 698-0098 and ask to speak with a party coordinator today! Keep Cool in the Shade. Between our giant pavilion, private gazebos and big umbrellas, your party will have a reserved shady spot to relax, eat, and open presents! Big Don's has the best Swag! We dedicate one member of our staff to oversee your party and make sure everything goes smoothly and in a timely fashion so you can focus on your kids. 1. Browse our Things To Do page (some activities are group size dependant). 2. Call 315-698-0098 or email info@bigdons.com to get in touch with a group event planner and see available dates and activities and receive special rates. Ask about available dates, as prime time slots can fill up quickly. 3. 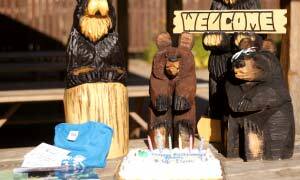 Let our experienced event coordinator help you plan the best visit for your group and budget. Big Don's can handle groups of any size, age, or ability. We truly have something for everybody! Many of our activities are wheelchair accessible and we have experience and a great reputation when working with differently-abled groups so that everyone has fun! Some of the types of groups we frequently accomodate include Summer Camp and Recreation groups (up to 100+ kids), Sports Teams, Scout Troups, Youth Groups, Daycare Field Trips and Corporate outings. School Bus Accessible Parking and Picnic Area to accommodate groups of all sizes: When you book an outing with us, we reserve an appropriate amount of covered or outdoor table space. Once you rent that area, it is yours to decorate for your occasion. Our covered pavilions can hold up to 120 students, and additional outdoor picnic areas can accommodate up to 240.
Who is a "participating guest"? A “participating guest” is the birthday child and any of their friends and family members who will be participating in activities, receiving party favors, and included in the pizza / drink count. Additional food can be ordered for “non participating guests” such as grandparents and smaller siblings who only plan to sit at the pavilion and watch the party. Additional activities can be purchased for other guests at the main park window. We stagger our parties in order to allow time for clean up and set up in between. You may arrive 15- 30 min before the party starts and your party host will help you get settled in as soon as the space is cleared. Do you provide the cake? No- We leave the cake up to you but if you’d like a hassle-free party, we have options to add on ice cream cones instead. Do you provide paper plates, etc? Basic paper products are included as part of the party. This includes plates, napkins and forks or spoons as needed. However, if you have themed tableware that you’d like to set up yourself, you are more than welcome! Can I bring extra snacks and drinks? Yes. The reserved pavilion or gazebo space is yours for the time so you are welcome to bring additional snacks and drinks for your guests. However, we are a dry-facility so no alcohol is allowed on the premise. We also are an outdoor-facility so we ask that you keep sugary snacks and drinks covered when not in use to avoid the attraction of bees and other unwanted pests. Can I order extra pizza for other family members and guests? Yes- Your final pizza order will be taken at the beginning of the party to ensure you end up with exactly what you need on the day-of. At the end of the party- The total balance for the party plus any add-on’s (extra guests, tax, tip, etc) minus your deposit will be due. You must cash out in-person at the main building, as we do not keep your credit card information on file. What should I tell my guests to wear / bring? 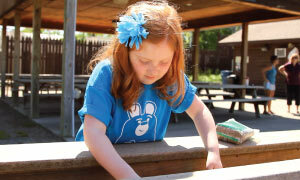 Since we are an outdoor-facility, we recommend shoes for all of our activities, including the squirt tube frenzy. Closed-toe shoes are required for laser tag. If you plan on doing a wet-activity , a change of clothes and towel is also recommended.